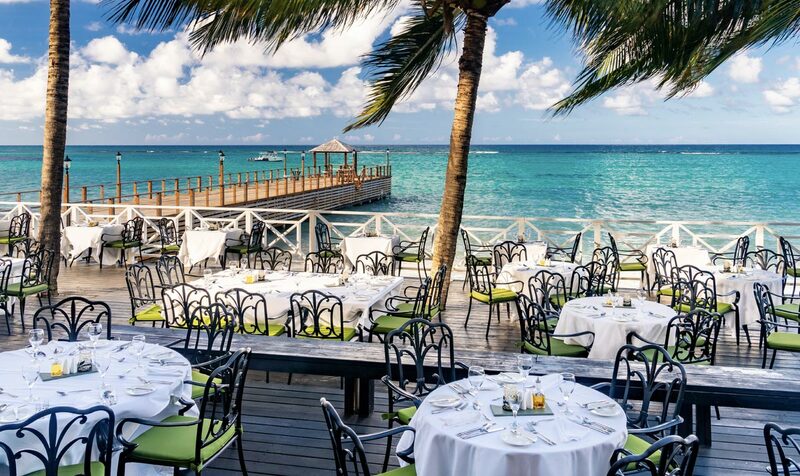 Satisfy all of your senses as you treat your taste buds to the vacation they deserve at Jewel Dunn’s River Beach Resort & Spa, A Curio Collection by Hilton. From the most formal to the most casual — where even shoes are optional, our dining venues are designed to please every appetite. Embark on a new culinary adventure at our six restaurants, then sip on hand-crafted cocktails while socializing at one of our five bars and lounges. 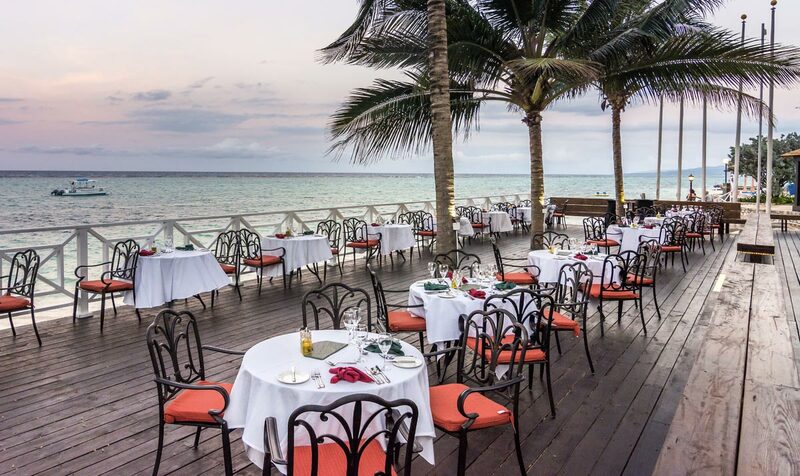 No matter what you’re in the mood for, you’ll have no problem curing your cravings with our resort’s all-inclusive food and drinks. That includes top-shelf liquor, too! Seeking a more intimate dining experience? Order room service (complimentary in suites), or splurge on a private beach dinner package. Whether looking to dine poolside, in need of a snack after the lounging on the beach or grabbing a quick bite before heading to the bars, you’ll find plenty of ways to satisfy your appetite in environments that embrace casual resort wear from morning to night at Jewel Dunn’s River Beach Resort & Spa, A Curio Collection by Hilton. 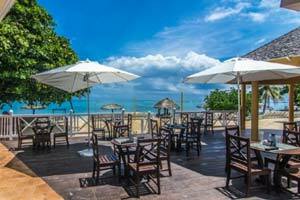 Indulge in the essence of Jamaica as you treat your taste buds to the most rich and elegant dishes available at Jewel Dunn’s River Beach Resort & Spa, A Curio Collection by Hilton. 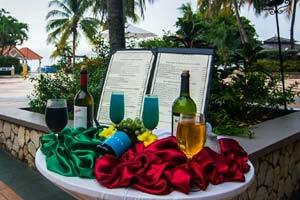 Perfect for spurring romance, the fine dining destinations at our all-inclusive resort make magical moments mouthwatering. Snack happily without having to stray from the beach. 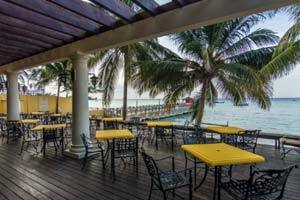 Aquamarina features a full-service bar, as well as made-to-order sandwiches, burgers and wraps. Dress code: Bare feet and bathing suits are welcome! 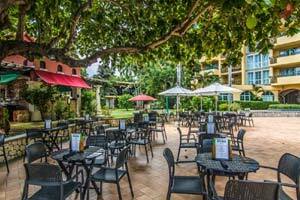 Dining Hours: 11:00 a.m. to 7:00 a.m.
Bar Hours: 10 a.m. to 6 p.m.
Savor fresh food that captures the taste of the region while situated just steps from the pool. Enjoy breakfast and lunch buffet style, then in the evening, sample international flavors buffet-style. Dress Code: Resort evening casual – slacks, skirts, dress shorts and sandals welcome. 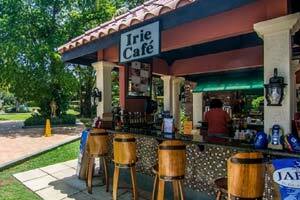 Dining Hours: Breakfast: 7 to 10:30 a.m.; Lunch: 12:30 to 2:30 p.m.; Dinner: 6:30 to 9:30 p.m. Whether relaxing poolside or spurring an underwater adventure, pizza is a great way to refuel. Enjoy customized, thin-crust pies crisped to perfection in a fire oven. Dress Code: Casual — including swimwear. Dining Hours: 12:30 p.m. to 9:00 p.m. Enjoy a variety of beverages (and pastries) to jumpstart your day. Our oceanfront swim-up bar invites you to indulge in tropical drinks without having to get out of the pool, allowing nothing to get in the way of your relaxing getaway. 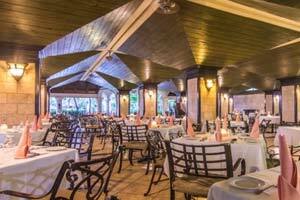 Get transported from Jamaica to the Mediterranean as you indulge in the finest spaghetti, chicken and pork in a truly authentic Italian dining experience. 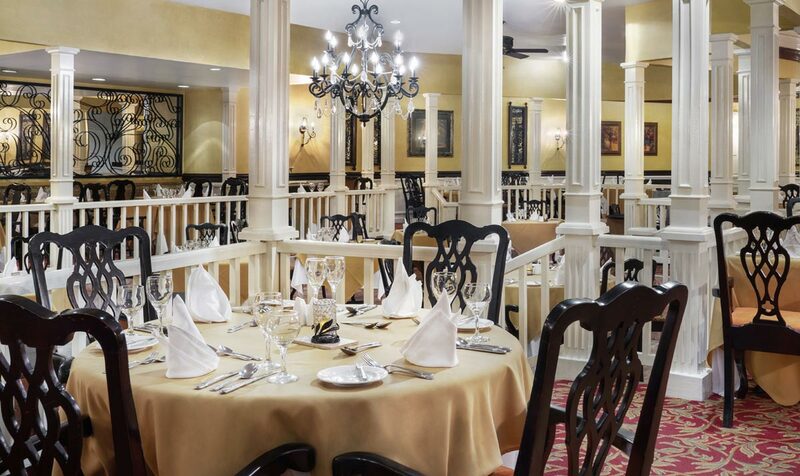 This exquisite dining room combines Caribbean cuisine with a distinctive Jamaican flair, perfect for seafood lovers looking for a special twist on traditional favorites. Dress Code: Resort elegant. No jeans, shorts, sleeveless shirts, T-shirts, caps, tennis shoes or flip-flops allowed. Dining Hours: 6:00 p.m. to 9:30 p.m. In the mood for dinner and a show? 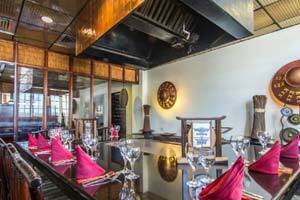 Enjoy teppanyaki-style dining and tableside entertainment. Set seating times require reservations. 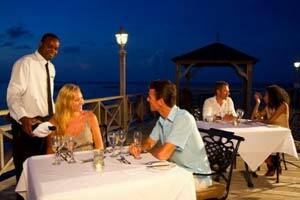 Dining Hours: Resort evening casual – slacks, skirts, dress shorts and sandals welcome. 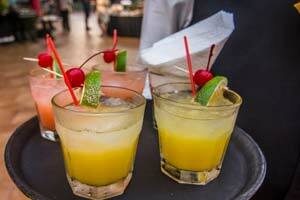 Dining Hours: 6 to 10 p.m.
Sip and savor your favorite libations beachside at this vibrant social scene, day and night. Just because the sun goes down doesn’t mean the fun ends. 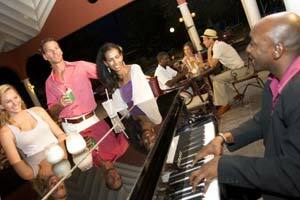 Gather around the piano with custom-concocted cocktails for a fun social outing with old and new friends. 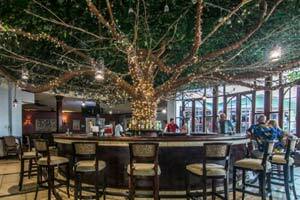 Hours: 11:00 a.m.. to 1:00 a.m.
Set your evening in motion in a vibrant setting as you enjoy your favorite libations from the full-service bar illuminated by twinkle lights.. Hours: 5:00 pm to 2:30 a.m.